Fiber Glow is the ideal product for both hot-water extractors and pressure spray and rinse systems. Cleans and rinses effectively with hot or cold water. Contains non-toxic inhibitors to prevent mildew stains and odors. No rinse needed! Gentle to skin. Fiber Glow Powder is safe for workers and customers. Gentle on skin. 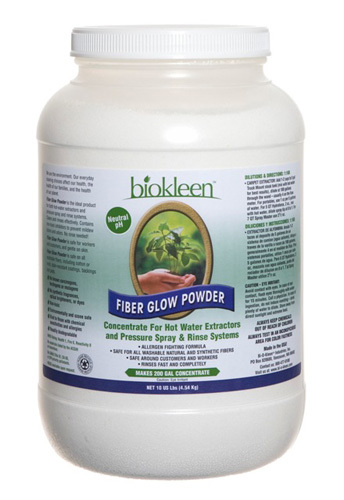 Fiber Glow Powder is safe on all washable fibers, including cotton or wool, stain resistant coatings, backings and pads. For Hot Water Extractors and Pressure Spray & Rinse Systems. 10 lbs; Makes 800 Gallons (Super Concentrated) 1oz : 5 Gallons of Water. CONTAINS NO: Phosphate, Chlorine, Ammonia, Petroleum Solvents, Alcohol, Butle, Glycol Ether, SLS or SLES, EDTA, DEA. No SARA Title III, CA 65, or EPA Priority Pollutants. No Materials Listed by the ACGIH as Hazardous.